Surely training camps are just for pro athletes like you? We’ve just stayed at Tri Sports Lanzarote with heaps of other athletes – from beginners right up to Kona champions. It was a perfect location: 10 minutes from the airport, straight out on to (mostly) well-paved roads and trails and 10 minutes from the run course and swim venue. Breakfast, lunch and dinner were all prepared and there was a pool (for relaxing) about eight seconds from the bedroom! They run a “kick start your year” camp aimed at athletes who have never competed in an IRONMAN or 70.3 and want to improve performance and technique or simply train with a new group and meet new people. How many training camps do you attend each year? This year I’m fortunate to head out on two camps: the first was in Lanzarote (see above) and the second in Portugal with Triathlon Scotland in February. I usually try to escape the Scottish winter once a year – twice is a luxury! What are the main benefits of going to a training camp? Motivation. You’re more than likely to meet new people and make lifelong friends who have similar goals to you, which will help you to stick with your training. Recovery. On camps you can reap the benefit of actually recovering from tough training sessions – just being able to sit and chill is probably a rare luxury for most age groupers. Preparation. 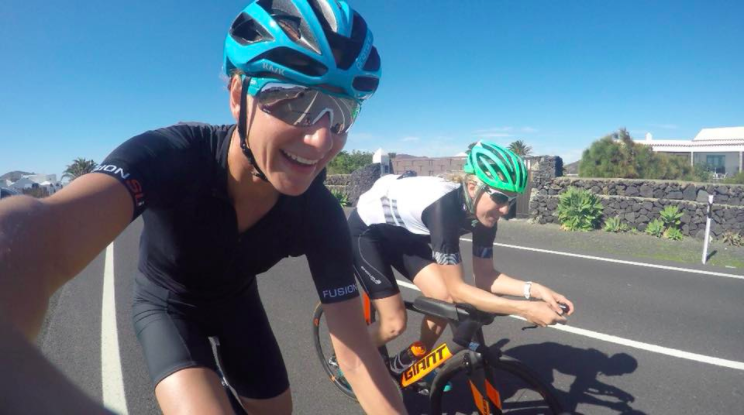 When we were in Lanzarote, our training programme was created specifically with IRONMAN 70.3 Dubai in mind, which meant that we weren’t clocking more than 20 hours training in one week – perfect for preparing for an early season 70.3. Instinct. By this I mean leaving the Garmin behind and going by feel. If you don’t have a race for yonks, it’s a good habit to get into. If you’re training more than usual, you need to learn what an easy run or ride actually feels like. Escape. The benefits of seeing the sun, running on dry roads, wearing shorts and a t-shirt and smelling suntan lotion cannot be underestimated! What should athletes consider before booking? Ask yourself what you want from a camp. For example, if you train alone but want a group environment, there are camps out there that offer that. Alternatively, if you really want to maximize recovery between sessions, find a camp offering half- or full board. The other thing you need to consider is timing. Personally, I need to escape the winter grind and see the sun. Even if I wasn’t racing in Dubai, I love to get away as much as possible in January and February (the hardest two months in Scotland!). If you’re lucky enough to get some time off work, a small camp to acclimatise to hot or cold condition races is definitely worth the time and investment. Huge thanks to Nikki Bartlett for taking the time to talk to us. Follow Nikki via her website and Instagram @nikkibartlett1. Nikki placed seventh in the IRONMAN Dubai 70.3 in February (well done Nikki!) and will race IRONMAN South Africa in April, the Challenge Championship in June and IRONMAN Staffordshire 70.3 in June.